Sir Seewoosagur Ramgoolam International Airport, also known as Plaisance Airport, is located on the south eastern coast of Mauritius and got itself a new terminal in 2013 changing the whole experience of arriving and departing from Mauritius. The runway is even long enough for the A380 to land. I am kind of nostalgic of the old airport – even though the ceilings were too low and the air conditioning was quasi inexistent! There was a happy mess at the arrivals. I understand the need for the upgrade though. With the new airport, came better lounges. The Air Mauritius Lounge – the Amédée Maingard Lounge – is located in the departure hall. After security checks, through the (not so cheap) duty free area, to the right at the level of gate 28. It is on 2 levels with 2 separate lounges. I think that they use the downstairs one in the morning and the upstairs in the afternoon/evening. But I might be mistaken – it could just be coincidence that the few times I was there it was like that. The lounge is open all day and serves breakfast, warm food, cold drinks and usual spirits. You have access to Mauritian and International papers, books and magazines. There are TVs and a business center, located on the ground floor, a corner for children, on the first floor as well as several different kinds of sitting areas. There is also a shower area to freshen up. Business Class passengers and Kestrelflyer Gold members (Air Mauritius frequent flyer program) have complimentary access to the lounge. Economy passengers can request access for a fee – with a maximum stay of 4hours. You can either book on the Air Mauritius website when you book your tickets or buy the access at the Air Mauritius counter in the check in area (before you go through the passport control). Well, I have visited a few lounges and I have to say – I rarely find them that exciting! Don’t get me wrong it’s very convenient to have access – just to have a quieter place to relax (or work), somewhere to get a snack and something to keep the kids entertained with! There are things that I like about this lounge though. The upstairs section is very open and bright, you have this awesome sitting area and their service is actually quite nice – it is clean (the tables are waitered constantly). 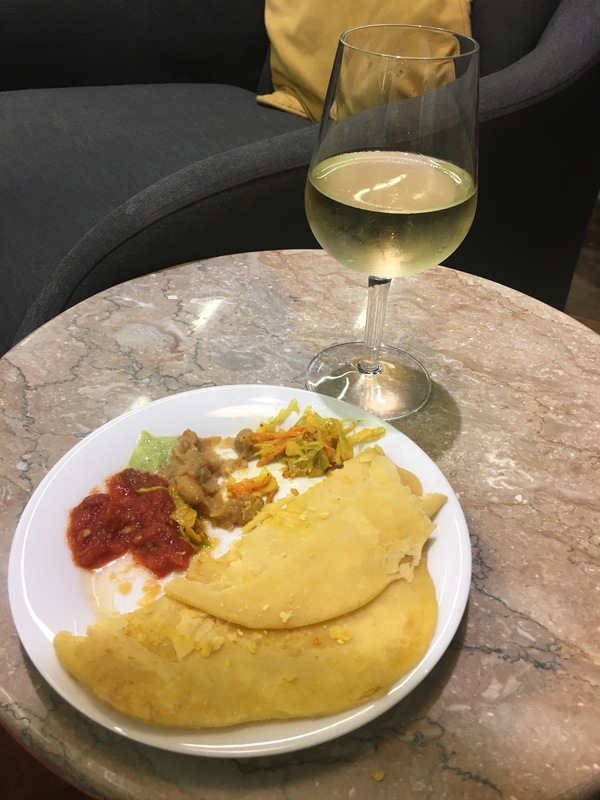 The food is ok – I do enjoy their Mauritian specialities in the afternoon (like the dholl puri), other things are just whatever. Their wine/spirits selection is fine – nothing extraordinary – their wines are the same served in Business Class in the planes. 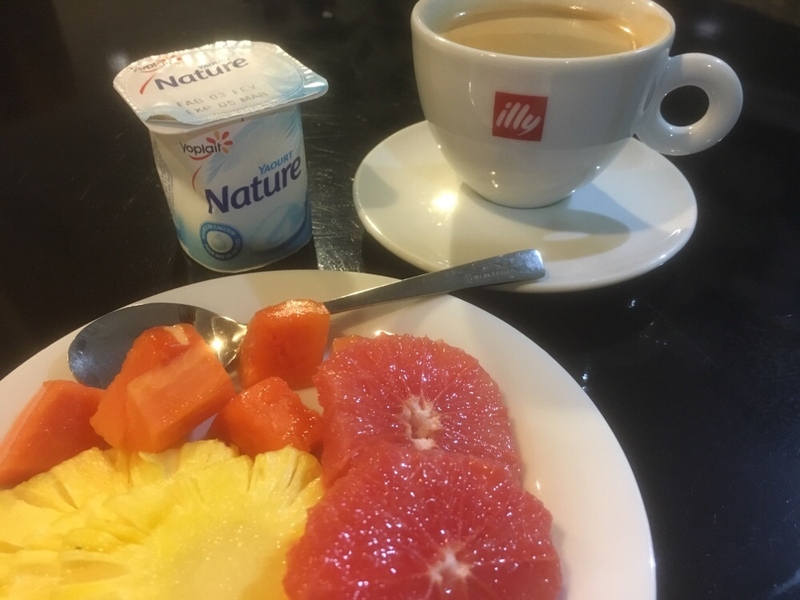 This time I had breakfast: just fruits, yogurt and coffee for me – they do offer a selection of heated croissants and other pastries which is a nice touch, their coffee is Illy (so not half bad) and then all the usual suspects from cold cuts to strange looking beans. Is it worth paying Rs 2000 for? well I guess it depends how much time you have in front of you. If you arrive very early at the airport it could be nice – there is not much to look at, and the other dinning options are not that exciting. There is also another lounge at the airport, the Atol Lounge, located In front of Gate 19. I think they are for flight not on codeshare with Air Mauritius (as well as Priority Pass card members). I have never tried that lounge. Helpful review Julz. I’ve not stepped inside an airport lounge; busy working or sleeping with the odd meal here and there. We do have a 12 hour layover in KL Malaysia in 2 weeks, heading to NZ. May be worth a lounge investment for the shower alone because being on the road for over a day takes its toll. Freshening up with be the order of the day.